Here is another great custom set for a client! 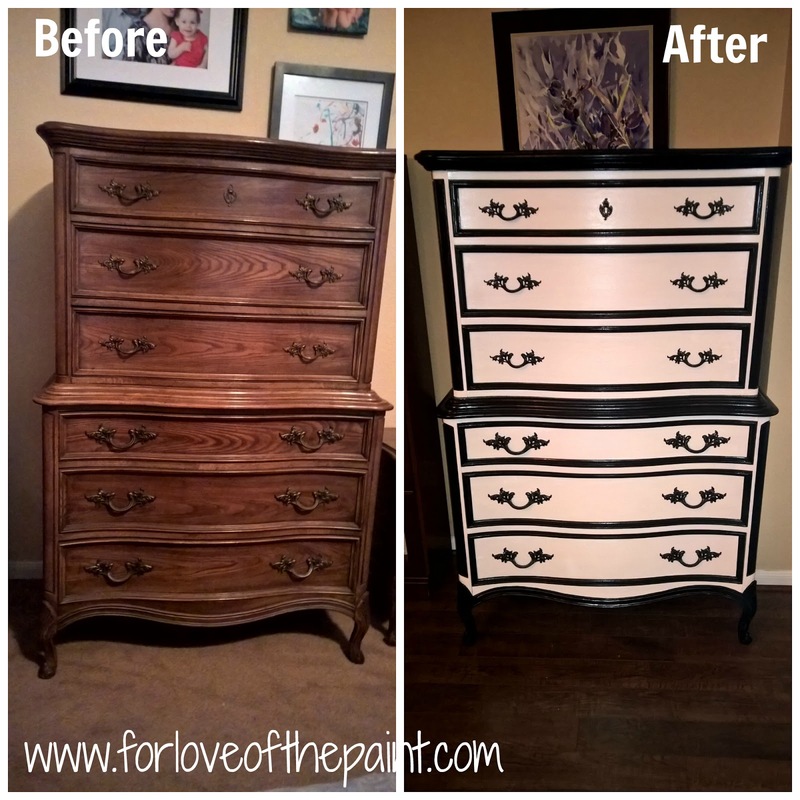 She really loves black and white, and so we designed this beautiful refinish based on an inspiration piece that was all white, with black trim. 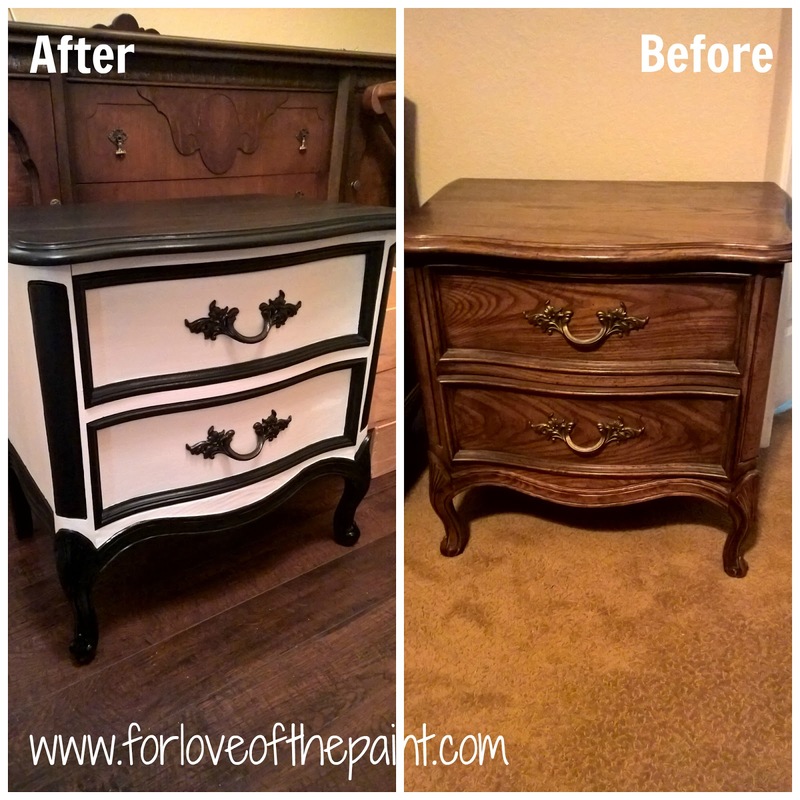 The gorgeous chest of drawers and nightstand are curved, and also had beautiful wood grain. What this means for a high-contrast finish is that even after a secure taping between colors, I still needed to come back and use a fine detail brush to touch up. It was worth it! 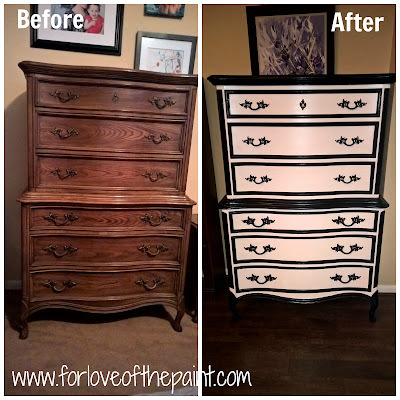 This high-impact refinish is a total showstopper! I really love the soft vintage-y feel of Annie Sloan Chalk Paints, but they don't make a true black. So for this, I borrowed a tip from another refinisher, and combined Graphite Paint with a bottle of India Ink to make a jet black. I also spray-painted the hardware with Rustoleum hammered look black. The trick to getting a beautiful finish while preserving the original shapes of the hardware is to use light passes and build the color, and not let it pool from overspray. The faux keyhole at the top could not be removed without risking damage, so I sprayed directly into a disposable bowl, then quickly and carefully applied the paint with a QTip, pressing first in the center of the metal, then pushing the paint toward the sides. Bonus picture of the coordinating nightstand! The client wanted a shiny finish, so we selected a crystal clear water based Polycrilic. Take care to seal the white areas first, then the black areas, as your brush may pick up a bit of the black color. I also frequently rinsed the brush and wiped on a painter's rag to make sure the finish was perfectly clear. This set is so beautiful, and reminds me why I love collaborating with my clients! They all have such great ideas and individual aesthetics, and I am honored that they allow me to help bring their visions to life!